Cleckheaton's Ashleigh Hallas tries to evade a challenge from Batley's Suzy Hudson during last Saturday's ladies hockey derby. Batley Ladies hockey team bounced back from last week’s defeat by grinding out a hard-fought 1-0 derby win over Cleckheaton in the Yorkshire Hockey Association Division Four West on Saturday. Batley fielded a strong side against their local rivals and started off well, taking control and passing the ball round the Cleckheaton players with ease. Sarah Fretwell and Janna Macinnis worked well together in the centre to keep up the attack and they drove the ball through from midfield to win Batley some penalty corners. From one of these Batley looked to have scored but the goal was disallowed. This put Batley on the back foot somewhat and the control they had shown from the beginning of the match started to drop, with Cleckheaton making attacks of their own. These we’re quickly closed down by Mel Neal and the Batley defence, pushing the ball out down the wings to keep pressure on Cleckheaton. Batley kept pushing for that elusive goal with chances up front for Kim Sharples and Jo Forbes but it remained scoreless at half-time. Cleckheaton made some challenging attacks at the beginning of the second half, forcing saves from Helen Langwick and eventually winning a penalty corner. After a successful defence Batley were straight back on the counter attack with speed through the midfield. Batley created several chances and finally, after another penalty corner, Sarah Fretwell’s strike found the back of the net for her first goal for the club this season. Keeping their cool Batley defended their lead well through the final minutes of the game ending the match 1-0 with Fretwell named player of the match. 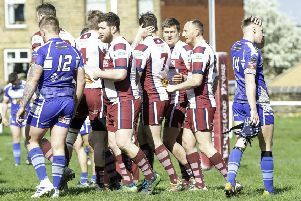 Batley travel to Harrogate fifth team on Saturday, with their opponents one place above them in the standings, while defeat leaves Cleckheaton third-bottom still searching their first win of the season.